Peche Island is a 100-acre island situated in the Detroit River near Lake St. Clair. 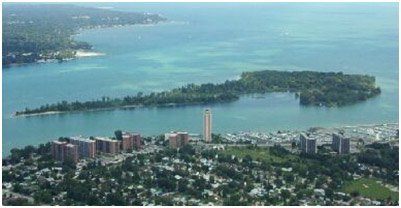 Located approximately two kilometres from Belle Isle, Peche Island is currently owned by the City of Windsor, which obtained it from the Province of Ontario in 1999. The island currently functions as a municipal park, is accessible by boat, and contains amenities including docking facilities and walking trails. Peche Island has also been known as Isle aux Pecheurs and Isle a la Peche and was purchased by Hiram Walker’s sons on July 30, 1883 from the estate of William G. Hall. Hall had been the previous owner of the majority of the island. However, the Laforet family, who had inhabited the island since as early as the 1780s, owned four acres. Walker was caught up in a legal battle with Benjamin Laforet following the purchase of the island, with Laforet filing a claim that he and his brother had a one-third interest in the land. The case was settled, with the estate of William Hall being ordered to pay the Laforet family one third of the amount that Walker paid for the island. In the early 1880’s, Leo and Rosalie Laforet were still living on the island. Leo died in September, 1882. Later that year, some of Walker’s agents visited the island, forced their way into Rosalie’s house, and told her to leave the island by the spring of 1883. When it was time for the Laforet Family to leave, Rosalie cursed the Walkers and the island. It is reported that she said “No one will ever do anything with the island”. Walker took great interest in developing the island. In addition to building a mansion (described as having anywhere from 40 to 54 rooms), he built a greenhouse and an icehouse, and planted an orchard. The island was also equipped with a golf course, stables, and a carriage house. Walker purchased two yachts with the purpose of transportation to and from the island. Walker sold the island in 1907. City of Windsor. (n.d.). Peche Island. City of Windsor: City Parks. Dillon, M. M. and Company Ltd. (1973). Peche Island Provincial Park. Toronto, [n.p]: 1973. Library of Congress. (n.d.). Peche Island. Prints and Photographs Online Catalog. Malott, Carol. (1982). Peche Island. Windsor, Ont. Adult Literacy/Windsor Public Library. Weeks, E. (n.d.). The Curse of Peche Island. Walkerville Times Magazine.